Over the last few days, I've been working to put together a few Visual Studio 2010 Online Templates to help kick start development of Windows Phone 7 (WP7) applications in F#. These templates are now available on Visual Studio Gallery. 1. 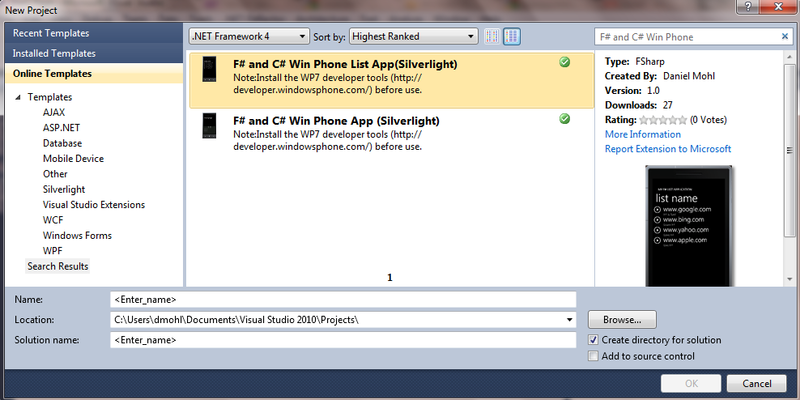 Download and install the Windows Phone Developer Tools. 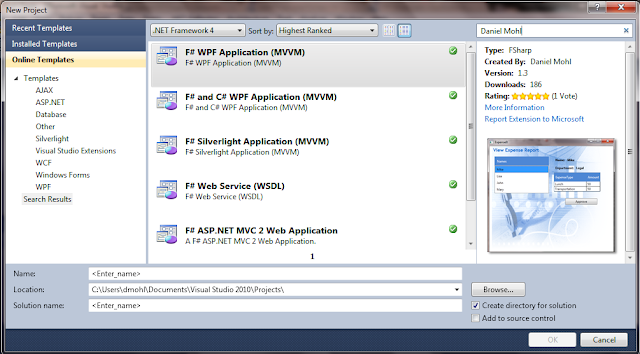 Note: The WP7 FSharp.Core.dll has been included as part of these templates. It is also part of the Microsoft F# August 2010 CTP. As always, I'd love to hear your feedback on these templates as well as ideas for others that you would like to see. In my last post I pointed out that the five templates that have been previously announced on this blog are now available on Visual Studio Gallery. In this post, the count is being raised to six. Thanks to Don Syme and a few others, a new "all F#" Silverlight template has been packaged and placed on Visual Studio Gallery. "This is a F# project template that generates a Silverlight solution with logical separation between View, ViewModel, Model, and RemoteFacade. While the Silverlight application is built entirely in F#, a C# web application is included for the purpose of providing a hosting example. " 2. 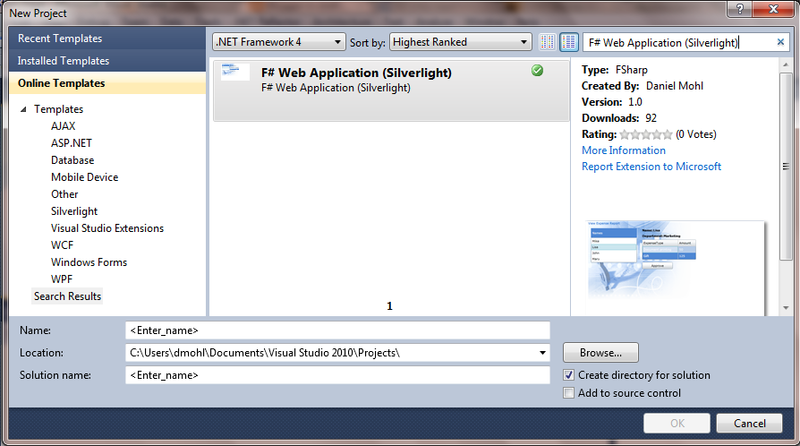 Search for Daniel Mohl or "F# Web Application (Silverlight)". provide better naming consistency. The new names are as follows: F# and C# Web App (ASP.NET, MVC 2), F# and C# Web Service (ASP.NET, WSDL), F# and C# Windows App (WPF, MVVM), F# Windows App (WPF, MVVM), F# and C# Web Application (Silverlight). As Don Syme mentioned in a recent blog post, I've been working to get the five F# templates that have been announced on this blog up on Visual Studio Gallery. I'm happy to say that all are now available. Additionally, I strongly recommend that you check out the two templates created by Jomo Fisher. I'd love to get your feedback on all of these templates. Also, let me know if there are any additional F# templates that you would like to see.